A common misconception about Youthfront is that the organization is just a summer camp. The thought is that “offseason” months act as time for staff to regain energy and prep for the next summer. This is not true. Youthfront is more than a three-month summer camp. The focus of the organization is Christian formation and bettering the communities around Kansas City and the world. Snack Shack KC is just one of the many justice initiatives created through Youthfront to offer a place of restoration for youth. What started as a dream for several high school students turned into a living, breathing social entrepreneurship organization. With Youthfront and The Franklin Center partnering together, Snack Shack KC acts as an after-school program for youth. It includes low-costing snacks, games, tables for homework, and volunteers ready to play and engage with anyone who walks through the doors. The youth team who created Snack Shack KC has worked extremely hard to create a space that will be beneficial for the entire Argentine community. Youth social entrepreneurship at Youthfront is first, about sparking imagination to join God’s mission. We hope to bring about restoration–to bring glimpses of heaven on earth–especially in communities experiencing brokenness. Second, it’s about equipping youth with practical skills and providing support to make their dreams become reality. 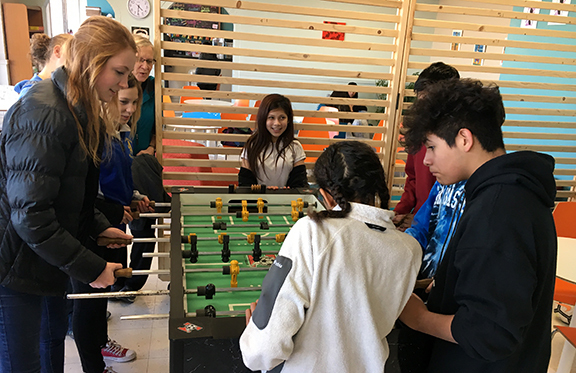 Located in the Argentine neighborhood of Kansas City, KS, Snack Shack has sparked positive social change since first opening its doors earlier this year. On average, there are at least 75 students who visit the location every day. Director of Community Programming Amber Booth has witnessed how the Snack Shack KC mission has pulled community members closer together. “Each week we are seeing new and different students. We are slowly seeing more families coming too as a place to hang out as families where they can buy snacks and play games,” Booth said. What really works for this new program has been the peer influencers in the community. More and more students are bringing friends to experience the fun and casual atmosphere. The Snack Shack KC team is hoping to see even more growth and prosperity in the next few months. When the 2017-2018 school year is completed, Snack Shack KC will still operate as an afternoon hangout space for youth. For more information about volunteer opportunities or donations, please visit our website or contact the Director of Community Programming Amber Booth at abooth@youthfront.com. To apply as a volunteer, fill out this online form.